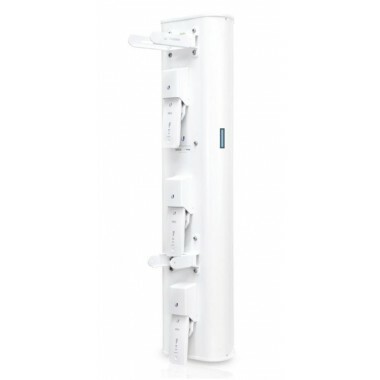 Overview Ubiquiti Networks introduces an innovative sector antenna for your Point-to-MultiPoint (PtMP) applications, the airPrism® 5 GHz 3x30° HD Sector Antenna. The airPrism antenna features significant advances in noise isolation and beam performance to complement the Rocket®5ac Prism™ radios (not included) for co-location deployments. The airPrism antenna and Rocket5ac Prism radios have been designed to seamlessly work together. Every airPrism antenna has three built-in Rocket radio mounts, so installation requires no special tools. Snap the three Rocket5ac Prism radios securely into place and mount the antenna for your PtMP link. The three Rocket5ac Prism radios are installed at the top, middle, and bottom of the airPrism antenna. Each radio independently transmits and receives within its corresponding 30° beamwidth. Refer to the diagrams below for a visual representation of the beamwidth coverage. Channel Offset The size of the required offset depends on the channel width.